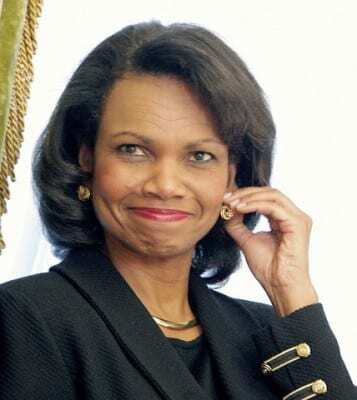 Condi Rice: Still injecting criminal lies with impunity, courtesy of the US media system. We all know that in the political ambit Americans have nowhere to go since the game is rigged and the so-called “two” parties that dominate and soak up all the oxygen are in reality one party with two faces, both serving the reigning plutocracy. America has not been a democracy for a long time (bourgeois democracy never is), and in the last 30 or 40 years even less so, as degeneracy has now brazenly entered the center stage. What we have today is a plutocracy extremely adept at presenting itself as a flawed but nonetheless true democracy. It’s a major imposture, literally a class act without parallel in the annals of history. A con job of galactic dimensions. And curiously, but entirely logically, the entire political system is itself a version of the old “Lesser Evil” concept applied to Democrats: it seems to be saying, yea, we’re flawed, the system is not perfect, but look around. Would you live in North Korea? CBS This Morning (10.2.13) deploys none other than Bush protegé Condi Rice as a supposedly impartial expert on foreign affairs, an opportunity she seizes to stoke war against Iran. While documented criminals like Rice are allowed access to tens of millions of minds on any given day (something all US tv outlets and newspapers do) no cogent antiwar figure is ever allowed onscreen, an eloquent indication of the indecency and complicity of what passes for American journalism. As many observers have noted, the American propaganda system is several magnitudes more effective and insidious than any previous totalitarian system of thought control. Goebbels, an ambitious liar, was crude and transparent in what he did, at least to so many people that his propaganda machine could not be seen as dependable for the long term. In America, the cynicism is so great, the expertise so advanced in the tools of deception, the lies so old and well implanted and repeated over and over again, that few escape their influence. How is this trick accomplished? Goebbels, an ambitious liar, was crude and transparent in what he did, at least to so many people that his propaganda machine could not be seen as dependable for the long term. There is really no mystery to it. Complex as it may be, the process has been extensively and lucidly analyzed by people like the late Alex Carey, whom even Noam Chomsky and Ed Herman pay tribute to (see his pioneering Taking the Risk Out of Democracy), Michael Parenti (Inventing Reality), and in the seminal work of Herbert Schiller (The Mind Managers), a friend and sponsor of Cyrano’s Journal. In contemporary times, the torch, besides Chomsky and Herman, now in semi-retirement as far as media commentary is concerned, is wielded brilliantly by Bob McChesney, whose Rich Media, Poor Democracy and The Problem of the Media should be regarded as must-read modern classics. As many of us are aware, this poisonous media architecture relies on and uses many voices and tools to knit its deceitful message. The main stock is naturally provided by the prostituted politicians, from the president on down, who are continually paraded and given global reach for their lies and distortions. The politicos are reinforced in their maneuvers by a huge mass of prostituted academics and “experts”, chiefly in the political, economic, and public relations fields, scum like Frank Luntz, the so-called Republican “pollster”, a man whose claim to fame is his ability to dress social policies injurious to the majority as requisite solutions. For extra safety, the system also utilizes a veritable legion of overpaid pundits and hosts sprinkled throughout a vast lineup of programs, some only slightly less obvious in their manipulative intent than others. Against this array, and lacking effective access to truly alternative opinion and news (despite the Internet, which contributes some truth but rarely in sufficient force to counteract the system’s framing of the issues), the average citizen doesn’t have a chance. So the American political system is rigged, a cruel joke, a fraud. And so is the media system, supposedly the watchdog of dirty politics and foundation of democracy via incorruptible reporting of reality. The proof that is so is everywhere. I’m certain that if Americans really had choices in politics, if a true party endorsing democratic principles existed, an entity capable of intelligent and brave leadership and mobilizations, or media transmitting reliable information (both mutually necessary for their existence), they would not be pulling their hair in frustration and desperation at the sorry spectacle of a government “shutting down,” or cities falling, like a mere household, into “bankruptcy”, or having to constantly reign in highly-placed warmongers of all stripes. Such ludicrous absurdities would never occur in a nation truly controlled and directed by the people. In sum, the reigning corporate circles, the “corpocracy” —let’s call them technically for what they are, the American/global bourgeoisie—despite some erosion, continue to control outcomes in the United States by constantly manipulating the consciousness of the public: reinforcing standing myths here, injecting new lies there, creating (with impunity) false flag events, and always suppressing vital information. It’s a nonstop job, and the toxic corporate media, enormous in its reach and ubiquity always oblige because, after all, they are owned by the cabal they shill for. Patrice Greanville is founding editor of The Greanville Post. He also serves as publisher for Cyrano’s Journal Today, and editorial director of Punto Press. CBS News analyst and Republican strategist Frank Luntz sat down with a group of Democrats and Republicans for their viewpoint on the government shutdown. Both sides agree that the two parties do not respect each other or the American people. Posted in AMERICAN BRAINWASH, CAPITALISM & SOCIALISM, CULTURAL POLITICAL ISSUES, IDEOLOGICAL COMBAT, IMPERIALISM, LIES AND PROPAGANDA, ROTTEN MEDIA, SCUM WATCH, THE AMERICAN WAY OF LIFE.